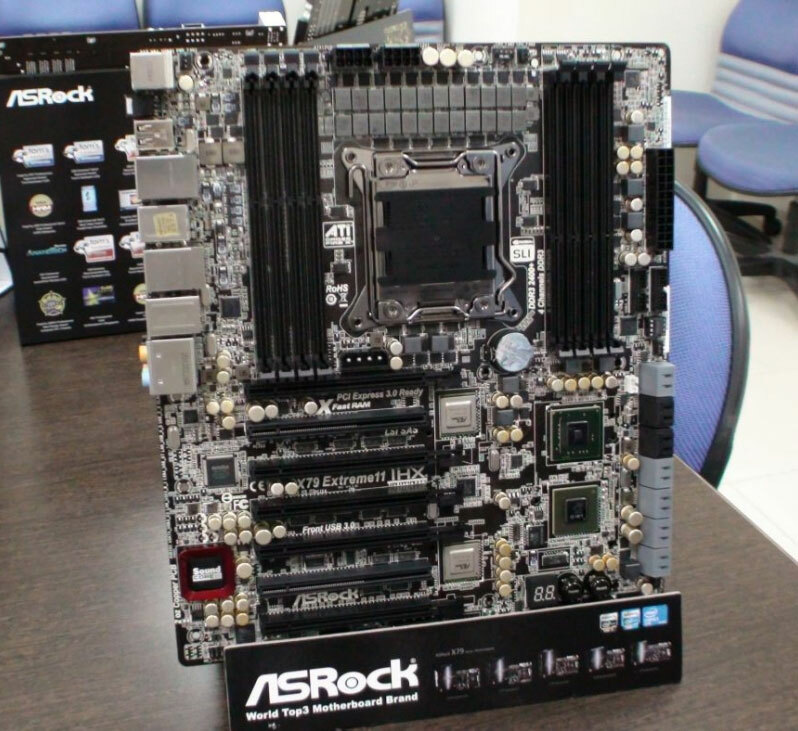 Looks like ASRock has given its flagship X79 motherboard “X79 Extreme 11” a complete overhaul by adding more VRM phases along with a few more changes. The biggest change we see are the VRM Phases which have been increased to 24 compared to the 16 VRM phases we saw back at CeBIT 2012. The board features the Socket LGA2011 processor to support Intel’s Sandy Bridge-E processors which are powered through 24 phase DigiPower VRM, Juice is provided through 2x 8 Pin Connectors. The motherboard has eight DDR3 DIMM slots (4 on each side of the socket) allowing support for upto 64GB ram with speeds of 2400Mhz+ OC. The memory is powered through an additional 4+4 phase VRM, two 4-pin Molex connectors are also fitted on the board to provide extra power when needed. The X79 Extreme 11 provides upto 32 PCI-e 3.0 lanes on the seven PCI-e x16 slots through the PLX PEX8747 bridge chip. Board supports Quad Way SLI and CrossfireX multi-gpu functionality. An LSI SAS2308 storage processor adds eight SAS/SATA 6 Gb/s ports featuring several Raid modes, An additional two SATA 6 Gb/s and four SATA 3 Gb/s ports are powered by the X79 PCH.